LAWRENCEVILLE, GA - The Gwinnett Braves (41-54) made it a one-run game in the ninth inning and loaded the bases with two outs, but couldn't complete the comeback in a 4-3 loss to the Scranton/Wilkes-Barre RailRiders (60-35) on Sunday afternoon at Coolray Field. Swept by Scranton/Wilkes-Barre in the four-game series, the G-Braves have now lost six straight games and have fallen into third place in the International League South Division. Trailing 4-2 with two outs in the bottom of the ninth, Gwinnett put together a rally that nearly tied the game. George Kottaras and Emilio Bonifacio each drew walks from RailRiders' reliever Mark Montgomery, and Daniel Castro followed with a single to shallow left scoring Kottaras. Ronnier Mustelier then drew a walk to load the bases, forcing Montgomery from the game. Diego Moreno was summoned from the bullpen, and he struck out Mel Rojas Jr. to end the game. Scranton/Wilkes-Barre broke a 2-2 tie in the top of the seventh inning, as Pete Kozma notched a leadoff single off Rob Wooten and scored on a one-out double by Jonathan Diaz. The RailRiders took a two-run lead in the top of the ninth as Eddy Rodriguez belted a solo home run to left-center off Ryan Weber. Gwinnett fell behind 2-0 on RBIs from Kozma and Jose Rosario in the top of the fourth, but battled back to tie the game at 2-2 in the fifth. RailRiders' left-hander Dietrich Enns loaded the bases on walks to Bonifacio and Mustelier and a single by Castro. Rojas Jr. followed with a two-out, two-run single to left before Mustelier was caught in a rundown to end the inning. After Enns yielded two runs on eight hits over 5.0 innings in a no-decision, RailRiders' relievers Giovanny Gallegos (W, 4-1) and Johnny Barbato (H, 2) combined on 3.0 scoreless, two-hit innings. Montgomery (H, 3) yielded a run over two thirds of an inning, and Moreno (S, 1) struck out the only batter he faced. The G-Braves' loss spoiled a strong Triple-A debut for right-hander Rob Whalen, who held Scranton to two runs on four hits over 5.0 innings in a no-decision. The Atlanta Braves' No. 26 prospect according to MLB.com, Whalen walked two and struck out six in an 86-pitch, 54-strike effort. Wooten (L, 2-3) gave up a run on two hits over 2.0 innings, and Weber allowed an additional run on two hits over 2.0 innings. 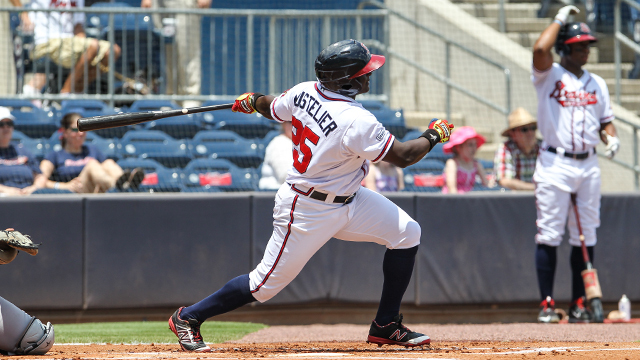 Mustelier reached all five times on the day for the G-Braves, going 3-for-3 with two walks. Castro also had three hits, finishing 3-for-5 with a run scored and an RBI. Rojas Jr. went 1-for-5 with two RBIs. Kozma had the only multi-hit day for the RailRiders, going 2-for-4 with a run scored and an RBI. Rodriguez homered for the third time this season and finished 1-for-3 with a run scored and an RBI. The G-Braves hit the road for a two-city, seven-game road trip starting in Syracuse, NY. Game one of a three-game series against the Syracuse Chiefs at NBT Bank Stadium starts Monday at 6:35 p.m. Right-hander Roberto Hernandez (4-4, 4.42 ERA with Triple-A Buffalo) makes his first start for Gwinnett, while Syracuse will counter with right-hander Reynaldo Lopez (1-0, 3.27). Tony Schiavone has the play-by-play call on 97.7 FM beginning at 6:05 p.m.
Tickets for all Gwinnett Braves' 2016 home games are on sale now at the Coolray Field Ticket Office, call 678-277-0340 or visit GwinnettBraves.com/tickets to purchase.